Reviews and reviewers can vary. In reply to a new book or a new film the reviewer has different motives – be they professional, journalistic or political/polemical. When I read Allan Armstrong’s review of my own book, The Red and the Green – A Portrait of John MacLean, it felt like a different kind of review. It was personal but certainly not in the way one would expect. It was refreshingly personal. It was not in any way, shape or form a personal attack as you would usually associate with “personal” in that sense. It was, however, a personal reflection of the man whom my book is about and who has inspired Allan throughout his adult political life. It also prompted a personal reflection of Allan’s political journey and it is important that this started Allan’s review. I suppose it is fitting that I give a summary of my journey. We are both socialist republicans and have arrived there from different locations as Allan is right to acknowledge. I am born and bred in a four mile radius in the east end of Glasgow. I was brought up a Catholic and still practice my faith – with all the falling in and falling out that would be expected of someone with left wing politics! My family were mostly of Irish descent and it is said that my politics came down a line from my Granny Cairns to my father to me (although family legend has it that they would have started a political fight in an empty house whereas I am more mild mannered.) My Granny wrote to IRA prisoners after the border campaigns in 1956 and had a wide library of Irish republican books. Young Gerard, however, always and still does feel more Scottish although I can be as romantically Irish as anyone when I am across the water. I was introduced to MacLean through a leaflet which my Granny gave me on The Irish Tragedy – Scotland’s Disgrace. This title from MacLean’s famous pamphlet was also the title of a public meeting. I have no recollection of the group or the date but the brief conversation prompted much reading and talking about this remarkable man. I do, of course, wish they were both here to see the book. At 17 I joined the Scottish Republican Socialist Party (SRSP.) It seemed natural. I saw no contradiction between my belief in socialism and my nationalism as expressed in my belief in Scottish independence. These beliefs had formed in discussions with my father, my granny and in reading. There is no doubting that I wanted for Scotland what the Irish were fighting for but this youthful view would be replaced by a considered look at the British State and how it operates which would mean that my belief in a Scottish Socialist Republic has cemented in time. When Allan mentions that I come from a more left nationalist tradition he is probably correct. I was drawn by the Scottish Workers Republic magazine which is a fine magazine edited by my old friend, Donald Anderson. There have been some fantastic outputs from some fantastic writers over the years. Some of these outputs formed a fine archive that would become a fine website. I am biased and so I should be. I have been a member of the SRSP for 32 years with the caveat that the Party became a Movement. I was a dual member of both the SRSP and the SNP for a while as I had friends standing for election for the SNP and was able to form links with the group in Edinburgh who had set up the Liberation magazine, which made a fine contribution to republican socialist politics. The Glasgow SNP knew who I was and I was unceremoniously expelled from the SNP as a dual member. As I mentioned the P became an M and the new Movement (with the same faces) joined the Scottish Socialist Party as a faction within the Party. I was Branch Secretary for Glasgow Springburn Branch and did my bit contributing to the Scottish Socialist Voice. Allan has a longer and better history in fomenting this through his work with the Scottish Socialist Alliance. I too remember the meeting where Allan spoke superbly well, with myself seconding, in a debate with Alan McCombes and Tommy Sheridan. Our joint contribution played a part in the ex- Militant Tendency in Scotland coming out for an independent socialist Scotland. I particularly remember the Glasgow Aggregate meeting to discuss the entry of the Socialist Workers Party (SWP) into the SSP. I spoke against and lost. Alan McCombes said at the meeting that the SWP would not come out the other end the same way that they went in. Alan was right and I was wrong as witnessed by the 2018 Bannockburn rally where the SWP were all under one banner selling the Socialist Worker on the field of Bannockburn. The world has turned upside down! My other political love was the John MacLean Society. I became Secretary from a young age. Not only did I first get to meet Allan but also some fine comrades – Jim Young, Bill Johnston and John Ford who were also office bearers. Pacifists such as Janet Cameron and Brian Quail. The Society was able to raise funds from the trade union movement to reprint Nan Milton’s biography of her father, John MacLean. This is still the definitive book on John. We also printed a collection of essays, Unmasking Reality and ensured that the John MacLean march (begun by comrade Tom Anderson in 1924) continues to this day. The Society is pretty much defunct now as most our members literally died. With Allan, I share a passion for history. We have crossed swords in various debates around the period of the Covenanters through to the Jacobite risings. I came into these debates naïve and with my Catholic baggage – The Covenanters were marauding Protestant bigots who could not be revolutionaries and John Knox couldn’t be right on anything could he? I learned a lot from my Edinburgh friend whose level of knowledge and clear learning in this area was impressive. I was surprised that I was an able adversary as I had nowhere near the expertise which Allan held but I was learning. I do see the Covenanters and their struggle in a different light, which is a great credit to those debates and to Allan. When I then saw Allan’s review and its length and scope I was humbled although the review was still a critique, a positive critique, of my book as I would have expected. I am very pleased that Allan acknowledges that I sought to raise some questions along the way. A hagiography would have been easy and perhaps understandable given my background. But this did not sit with my approach. I wanted to write something that was different and that was loosely chronological but not strictly so. I wanted themes that would overlap. Jim Young’s fine John MacLean: Clydeside Socialist was also thematic but differed in its scope. Allan is right to say that we have never engaged in sectarian debating as it is not our style. Neither should this reply be in that style although Allan raises some excellent points and I would like to come back to them. Some of the most positive feedback that my book has received has been on MacLean’s relationship with his old religion – Calvinism. I had no intention of focussing so sharply on this issue before I started researching until the evidence jumped out. I could see that other biographers, including his daughter and John Broom, had given this a wide berth. There would have been no justice to MacLean’s memory in any other description of him than as a convert. Without Charlie Marx he could have been a Free Presbyterian minister. And I do not intend to do his memory a disservice by saying that he probably looked and sounded like one all through his life. He did not just abandon his faith and then make a few occasional side swipes in later years. His mission, yes mission, was to take the fight to the established Churches who had chosen the side of the rich and powerful and to debunk their ethics and their morality as class hypocrisy. Interestingly, he did not debunk ethics nor morality as some others on the Left had done. “He must be unconscious of a great German ethical invasion, headed by one named Karl Kautsky. He must not have heard our orators preach from texts entitled “Thou shalt not steal,” “Thou halt not kill” “Thou shalt not lie” “Thou shalt not prostitute “ and so on. These preachments are certainly not to the taste of parsons and elders, because these gentle souls are most politely informed, in exquisitely choice language, that they steal from the poor, that they seduce youths into the armies and the navies to murder one another for the wealthy worshippers of Mammon, that they lie Sunday after Sunday in refraining from the exposure of the poverty of the people, and that they encourage prostitution by having in their churches employers who refuse to pay women a wage sufficient to provide the requirements of life. We Socialists do appeal to individuals; but our appeal is mainly to the masses to join together and break the chain of slavery. That is the most moral act that ever will have been accomplished, and its realisation is approaching with strides fast and furious. Individualism can be shown by Socialists to be scientifically unsound, and, if carried out logically breaks humanity into insulated units, completely separated each from the other. Without association of units there can be no morality. The densest dunce can surely fathom that primitive attempt at philosophical profundity. If Socialists are striving for a world an all-inclusive co-operative human society, they surely are advocates of the highest morality, as it would be the rock foundation for the brotherhood and sisterhood of all humanity.” – Scottish Notes, Justice, 7 June 1913. I quote this hopefully to show that this was at one level your standard Social Democratic critique of the clergy but when you read deeper there is a real rage against those who have abused their positions of power and influence. This was not just confined to the Presbyterian brethren. A year earlier he had criticised the Catholic Church and the Irish Party for its hypocrisy on Socialism and urging the Catholic Socialist column in Forward to engage with this. There is so much more that I could have put into the book on religious questions but did not want to totally bore my readers to death. That is why, while I don’t fall out with Allan’s view that MacLean was a secularist, it is a limiting definition. Secularists are not, in my experience, as interested in religion as MacLean was, nor do they take up debate in the ways in which MacLean did. My book brings out these examples of a remarkable engagement against his old Church. The “Pope of Marxism” (Kautsky) with his pseudo-Biblical texts had a fine Reforming, Scottish lieutenant. “Many teachers, from deep conviction, are Agnostics…” This throwaway line from an article in Justice, 26 April 1913 reveals a lot. Many teachers? It may have been true but usually this type of language is a code isn’t it? I suppose my point is that secularists can dismiss religion and its view of society as MacLean indeed did. MacLean, however, engaged with religion (while drawing secular conclusions) from the days of the Pollokshaws’ Progressive Union in 1903 through to leafletting St. Mary’s Episcopalian Cathedral in Glasgow in 1921 with a convert’s enthusiasm. Scotland and Ireland or Ireland and Scotland? The inference seems to be that this perhaps fits a left nationalist logic. I don’t fall out with this at all. Again, I tried to bring the logic in line with the logic of the book. The book is in two parts. The first part looks at MacLean’s life in the “Socialist Army” or the mainstream British Socialist movement. The second part looks at his break with British socialism and is entitled, “Ireland will only get her republic when Scotland gets hers.” This is a direct quote from MacLean towards the end of his life. It was very important to me that I started with his leaflet, All Hail, the Scottish Workers Republic from August 1920. This is in no way chronological but highlights the break. His former comrades would have been bewildered to read this leaflet. Leaving aside the serious debate around the sneers and insinuations on MacLean’s mental state, some of his former comrades would have thought colloquially that he had taken leave of his senses! It was a revolutionary leaflet with a real statement of intent – to challenge the formation of a British Communist Party. Two pushes and there was one pull – himself. I do not see this as some sort of mid-life crisis as this belittles it. Men change too in very different ways from our sisters. We can rail out all sorts of anecdotal evidence. Just last week I was talking with a friend who works with me who is male and roughly my age. He is from a Polish background and it has never been more important to him than over the past few years – going back to family, learning the language, his faith. Just one example. And I was conscious that I did not want to transfer other experiences, including my own, onto MacLean but it jumped out at me in his own language and the assumptions he made. It just seemed the most human interpretation rather than ideology – nationalist, republican or otherwise. I then consider the fact that MacLean had been talking about a Scottish Communist Republic in the summer of 1917 and the approaches from Ruaraidh Erskine of Mar on the Peace Conference and these tell this writer that MacLean was considering Scottish self-determination before his trip to Dublin in the summer of 1919. And while Allan is right to mention MacLean’s initial rebuff to Erskine from a Bolshevik viewpoint, it is also true that MacLean joined the National Committee to push for separate Scottish representation. So it is fair to say that it was maybe not Georgia but it certainly was Scotland and Ireland that John MacLean had on his mind from late 1918 and those two countries and their differing predicaments led to his revolutionary leaflet of August 1920. I really like Allan’s call for a “Labour in Scottish History.” There have been attempts. Jim Young made a fine stab with his The Rousing of the Scottish Working Class. This had some fantastic information and research but not the literary style or linkage to make it flow. Alan McCombes and Roz Paterson, some old comrades from the SSP days, have also brought out Restless Land: A Journey through Scotland’s Radical History. This is a very readable account of the Scottish working class story and would for a fine basis. Some of Allan’s own work on the Reformation (boo!) and the Covenanters (hiss!) would form fine chapters too. There may be a case for a combined effort from some of our best socialist and republican writers and researchers to produce a mirror to James Connolly’s masterpiece of Irish working class history. Just for the record I am joshing with the boos and hisses! I do hope that The Red and the Green is also a worthy contribution. I also feel that reviews such as Allan’s (and also by Stevie Coyle and Donald Anderson) have raised points for further research and debate. In terms of Allan’s review the point concerning the loyalist ‘carnival of reaction’ is certainly worth exploring. I would also add the socialist ‘reaction’ in adopting a Westminsterist, parliamentarian road that was mirrored by the Communist Party. This may not have been as ugly or sectarian but it was certainly reactionary. The British Road to Socialism was well named in every sense and was and is and will be a dead end. 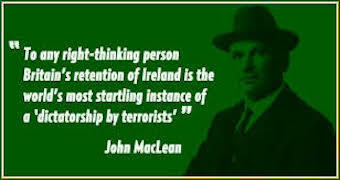 John MacLean was right in this regard and is an important part of his contribution to Left politics in these islands. I would also like to echo Allan’s conclusion that Scotland’s democratic revolution needs to be a republican one. We have both pushed this Scottish republican line – with no apology – for years from different directions. I have no doubt the contradiction of an independent Scotland under the British Crown will be exposed for what it is. Back to 1603! That slogan doesn’t really work for me. And just like the proverbial Lothians bus – you wait forever and then two come along. There is a new book coming out by Henry Bell. John Maclean – Hero of Red Clydeside. It can only be good if it gets us talking about MacLean, about socialism and political progress. That’s the pulling power of John MacLean.